After a several year hiatus, Drive Electric Week returned to Nashville in 2018! We made two BIG announcements this year: 1) we're starting an electric vehicle club called "Drive Electric Nashville" and 2) we announced the launch of Smart Charge Nashville, where EV drivers can earn $100 by sharing information about the charging and driving behavior. This year we had 13 electric vehicles, one electric bus from Nashville's WeGo, and 8 electric bicycles! 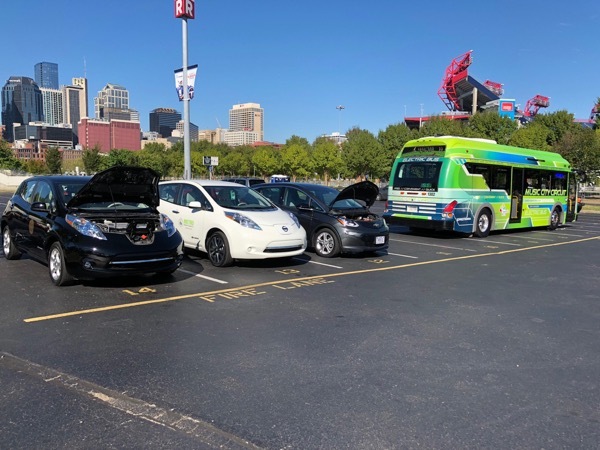 Join us at Nissan Stadium to learn about electric vehicles! See drive models from Nissan, Tesla, Chevrolet, and more while talking with EV owners. You'll also hear exciting updates about the future of electric vehicles in Tennessee! FREE COFFEE AND DONUTS are available to the first 150 guests! We'll meet next to the Siegenthaler pedestrian bridge at the Nissan fast charging stations (lot R). Special thanks to our local event supporters! Registered attendees report 292,852 electric miles driven.